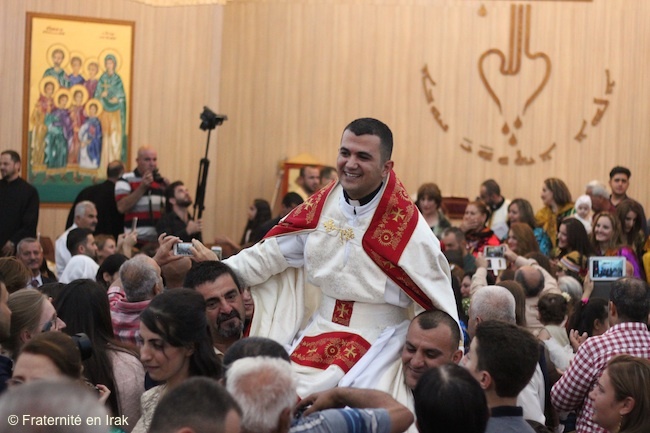 EVENT – On August 5, 2016, two years to the day after thousands of Christians fled Qaraqosh and the Niniveh plain, three young priests from the Syriac Catholic diocese of Mosul were ordained as priests in Ankawa, Erbil’s Christian quarter. The Brotherhood with Iraq reports on this celebration full of hope. As early as 8.30am on this Friday morning, the Mart Schmoni church is already packed. Families, friends and the regular congregation are all gathered for the ordination of three young Syriac Catholic priests. 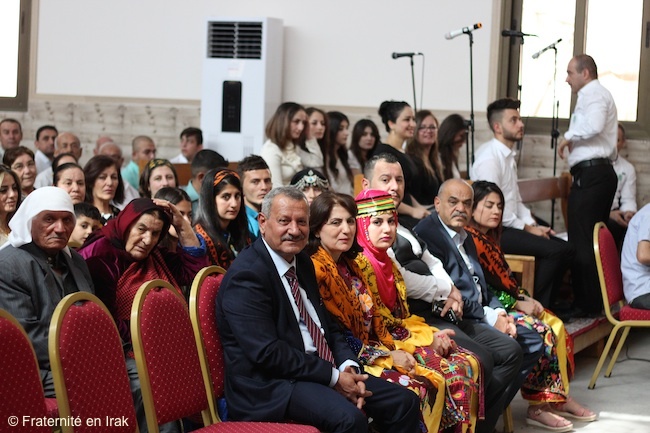 It is the first time that the Mart Schmoni church, built by Oeuvre d’Orient and inaugurated in April in Ankawa, the Christian quarter, hosts such an event. Among the four seminarians ordained as deacons in March, only three will be ordained on this day: Rony, Arteen (who, on this occasion, chose the name Petrus as allowed by custom), and Emad. 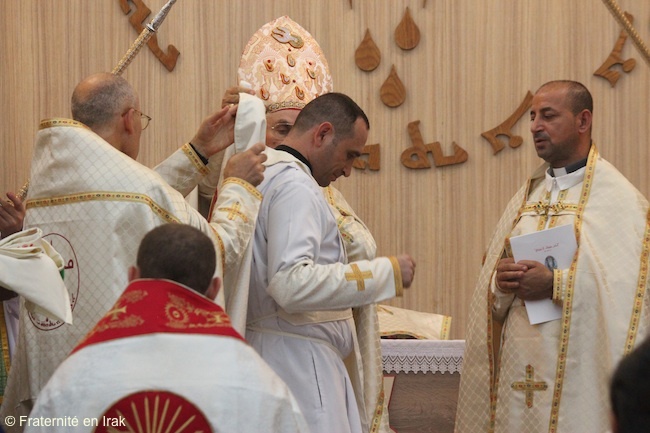 The fourth seminarian was assigned, at his request, to the Bagdad diocese. In the church, waiting for the ordinations. Rony is 27 years old and comes from Qaraqosh, where he grew up in a Christian family. God called him when he was a child, prayer being at the heart of their family life. “Our ordination, with my two brother priests, will give strength to people because they will see young people who have left everything but who bring a great peace. Our Church is alive! We are driven by a power that has nothing to do with a man’s power”, he explains. The atmosphere is joyful and the women’s youyous can be heard as soon as the seminarians enter the church. Some of these women wear Qaraqosh’s traditional outfit, bringing bright colors to the crowd. Their joy is infectious. “God bless you”, whispers one of them to our Brotherhood with Iraq team invited for the occasion. Despite the community’s hardship during these past two years in exile, there is hope and joy in the air, and it shows in the carefully prepared ceremony. The choir, in particular, accompanied the crowd’s fervor with songs for several voices answering to one another. Two rows of deacons and assistant deacons, as well as a large number of priests, are gathered around the three future priests. Mgr Gregoire Saliba, Syriac Orthodox bishop emeritus, is here too. The Mass is celebrated by Mgr Petros Mouche, archbishop of Mosul in exile in Erbil, whose superb vestments add to the solemnity of the event. 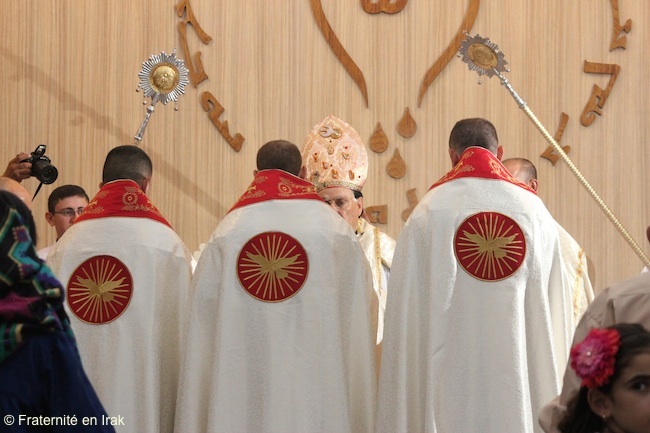 In the Syriac Catholic church, ordinations take place between the Consecration and the Communion, at the beginning of Mass. It is the main difference with the Latin Rite. Indeed, they wait for the Holy Spirit to come upon the Host (transubstantiation comes through the Holy Spirit in the Syriac Rite). A song during which deacons and priests answer to one another is the invocation to the Holy Spirit. Thus, all gifts of the Holy Spirit are called upon. After the consecration, the three young men kneel in front of the altar. As the choir launches into a song, the bishop moves toward the first future priest, singing too, and hides him under his chasuble while saying the prayer. It means that the Church gives life, to each individual personally. Contrary to the Latin Rite, anointing isn’t used: it is received during baptism, only once in an individual’s life. The bishop’s laying-on of hands is enough for the ordination. Then the new priests receive the garments they will need as well as one chalice, before blessing the incense and incensing their bishop and the whole congregation. At the end of Mass, they are given a triumphant welcome by their families and friends, to thunderous applause, youyous and a shower of candy. The entire congregation rushed to hug and congratulate the three new priests, whose exhausted faces where nonetheless intensely happy. For one morning, exile was forgotten and all hardship overcome. Tangible grace and hope brought Christians to the days they were home. 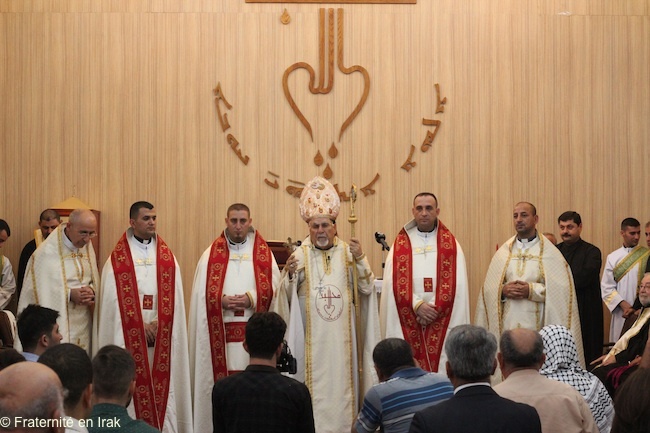 The priests of the displaced community are spread in three areas of Kurdistan. Rony, like his two other brother priests, will be assigned to all parishes connected to Mart Shmoni. They belong to Ankawa’s priest community, and will be available for all kinds of missions and services in the community.